Privately situated in Montecito’s coveted Riven Rock neighborhood, this legacy property offers every possible indulgence and the chance to live an unparalleled lifestyle. Ocean and mountain views, lush lawns, fragrant citrus trees, verdant gardens, and creekside pathways create the ultimate California backdrop. The remarkable residence sets a new standard in luxury construction. Numerous vignettes for entertaining, both indoors and out, luxe accommodations for guests and family, and space for staff and security blend beautifully over 5.5 acres to create an idyllic compound. The picturesque motor court offers the first introduction to the estate’s indelible combination of grace and stature. As the entry gate opens and you drive over the aged cobblestones, the residence, with its emerald ivy-covered walls, is revealed. Step inside the main residence and find yourself surrounded by an astounding work of art. Expertly capturing light and space, the foyer provides a remarkable sense of arrival. Extensive custom creamy-white millwork and stunning stone floors pave the way for a remarkable palette. The expansive formal living room is ideal for entertaining. 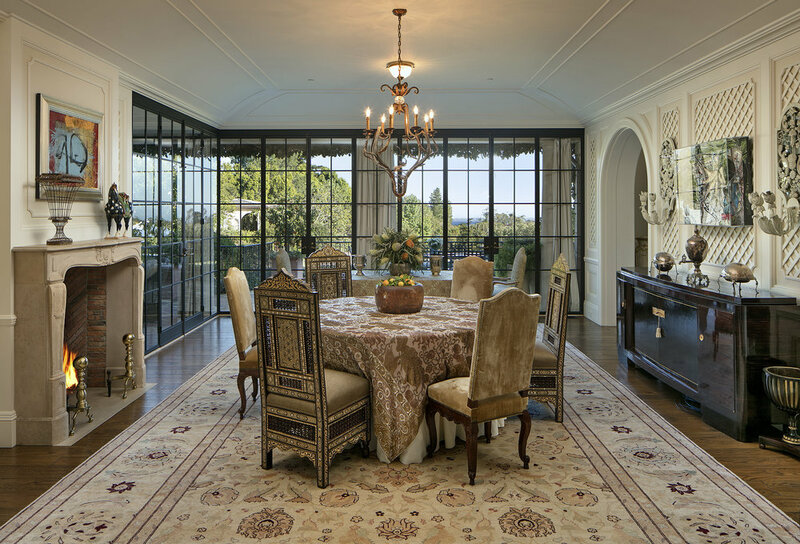 Three sets of arched French doors open to the ocean view terrace and magnificent gardens beyond. The living room walls are adorned with elegant moldings that create subtle shadows in the space, especially so when illuminated by the dancing glow from the fireplace. Varying width, wide-plank wood floors complete the elegant, yet comfortable space. Designed to highlight the ocean and garden views, as well as its many beautiful architectural details, the formal dining room ensures every meal is a visual feast. Coved ceilings add a gentle counterpoint to exacting iron doors, and a beautifully carved fireplace mantle gazes at lattice lined walls. The same soft shades of ivory found in the living room are on full display in the dining room. Two walls of iron doors lead to the ocean view terrace and a romantic outdoor fireplace. On the southeast corner of the main residence, the ocean-view family room offers a comfortable place to relax, read, write, or restore. Built-in shelving is perfect for photos and finds, and a handsome fireplace is a welcome companion on cool evenings. If the day winds down and the night winds up, for those with canned heat in their heels, a mirrored disco ball provides that spontaneous dance parties will always be properly lit. The breakfast room, conveniently located between the kitchen and family room, is perfect for everyday dining. Easily accommodating mornings on the run and dinners after dark, this space provides an air of casual sophistication throughout the day. Opening to the outdoor kitchen, with a built-in pizza oven, and dining terrace, the breakfast room readily transforms and transcends any meal into an al fresco experience. The family kitchen was designed to be effortlessly beautiful and imminently practical. Arranged purposefully to thrive with multiple cooks, dual La Cornue ranges, dual refrigerators, and multiple prep sinks offer expert function while beautiful Carrera marble counters and delicate tile details present sublime form. With space to create and room to spectate, this gorgeous space is ripe for culinary adventures of all kinds. Adjacent to the kitchen, three beautiful butler’s pantries provide more than abundant storage space. In addition to the family kitchen, a secondary professional kitchen is ideal for staff, catering large events, or hosting private cooking lessons. Ample workspace, multiple prep stations, and every appliance needed, ensure that even the grandest of events can be facilitated on site with ease. The envy of most restaurants, this kitchen is a chef’s dream. Tucked off the formal dining room and adjacent to the family room, a wonderful outdoor fireplace is a perfect place for morning coffee, or to end the evening. Cozy and romantic, this intimate space, overlooking the pool and beyond to the ocean, is sure to become a favorite hidden hideaway. On the western wing of the main floor, a gorgeous, ocean-view guest suite opens to a covered veranda. With a private entrance, the guest suite extends wonderful autonomy for those who come to call. A handsome home office is perfect for meetings, as a place to pen your memoir, or simply collect your thoughts. Extensive shelving can host a private literary collection, photos of loved ones, or trinkets and treasures. Opening to the lush aviary courtyard, the office fosters a sense of indoor/outdoor living. On the western corner of the home, a beautiful conservatory overlooks lush gardens and opens to the ocean view terrace. Herringbone pavers floors provide a classic sense of glamor, and 180-degree garden views make this endearing belvedere an integral part of the estate. In addition to the master suite, the second level is home to two additional ocean-view bedroom suites, a vast mountain-view lounge, and a nursery/playroom that is perfect for all sorts of creative endeavors. The lavish ocean-view master suite is a divine escape from the busy world. A crystal chandelier casts delicate shadows on the ethereal ceiling. Exquisite textile coats the walls with a subtle, minky shimmer. The hidden wet bar assures that sparkling water, and wine is always at your fingertips. Looking over the plush lawns and the sea beyond, the master is sure to please the most discriminating. From the master terrace, take in the splendor of Garden Lane’s incredible natural beauty. The lawn softly slopes to the sea before evolving into leafy forests, ripe with delights, and ready for exploration. Beyond, let your gaze settle upon the vast horizon and its endless ocean views. As a constant companion in the suite, these soothing views ensure a tranquil existence. The first master bath is a refined oasis. An elegant groin vault ceiling crowns the room and mirrored walls reflect views of the sea. French doors open to the terrace and allow Montecito’s natural beauty to be enjoyed throughout the day. The second master bath looks both south to the sea and east to the mountains. Book-matched slab marble in the shower creates a stoic work of art and an anchoring response to the ever-changing natural views. Beautiful mirrored closets offer ample storage options. Opening to the master view terrace, the second bath is a light and airy delight. Lavish closet space in the master suite rivals your favorite boutique. Impeccable white millwork, mirrored doors, and seemingly endless built-in shelving means that your closet looks almost as good as your wardrobe! A hidden hair-washing station is perfect for professional at-home touch-ups and blowouts. If the first two closets aren’t enough, enter the extraordinary space created for seasonal wardrobe storage, an unrivaled shoe collection, or even a private runway. Indulge your inner fashionista and give yourself permission to deck these halls with the latest finds and your favorite collections. In addition, the expansive lower storage levels offer an incredible repository for luggage, table top accoutrements, seasonal decor, dedicated fur storage, linen storage, and precious heirlooms. For additional security, a fireproof document storage room ensures maximum safety for valuable items and files. Gorgeous custom cabinetry lines the walls and ensures optimal storage conditions for your valuables. A dedicated wrapping room is ideal for packaging birthday presents and hostess gifts. The pool and its expansive terrace capture the essence of California summers. Shimmering in azul colored glass tiles arranged in concentric circles, this swimming pool is a work of art. Adjacent to the terrace, a beautiful covered loggia and fireplace offers a respite from the afternoon sun. With the guest house to the south, the outdoor kitchen with pizza oven to the north, and the main lawns to the west, the pool is centrally located within the estate. Nearby, two additional outdoor fireplaces combine to illuminate the grounds and tempt lingering evenings. Looking back to the main residence, over sprawling lawns, and in the shadow of the mountains, the home’s stately presence is truly appreciated. Beautiful architecture, symmetry, and balance showcase the refined sophistication for which Montecito is known. The poolside guest house is wonderful for extended visitors or as an additional entertaining space. Boasting the same attention to detail as the main residence, the guest house is a wonderful extension of the estate’s effortless combination of luxury and hospitality. Adjacent to the guest-house, a well-appointed gym takes fitness to a new level. Two walls of windows open to the gardens and fill the studio with sunlight and fresh breezes. Whether you prefer weights, cardio, barre, or yoga, this beautiful space will always leave you feeling inspired. Below the gym, a lower level bonus room offers space to expand and explore. North of the pool, an additional detached, ocean view bedroom suite extends the estate’s footprint and offers additional options for guests and staff. The enchanting 5.5-acre grounds inspire adventurers of all ages. Vast verdant lawns, enhanced by private water, beg for croquet and games of tag. Descend the softly rolling lawns to discover a hidden sanctuary, perfect for languid afternoon naps or meditation. Meander further still to come across a wooden bridge, chaperoning the sounds from the creek underfoot. Princes and princesses will have fun storming the castle in a magical zone amongst the forest replete with forts, towers, moats, and dragons. Whether you are in your fifth summer or fifty-fifth, there are sights, sounds, and surprises around every corner of the grounds. An expansive basement with soaring ceilings is home to an elaborate network of custom cabinets and closets trimmed in exquisite custom millwork typically reserved for the most lavish of master dressing rooms. In addition, an expansive subterranean garage is ideal for housing the avid collector’s toys from Bentleys to Bugattis. The adjacent workshop is perfect for projects and weekend tinkering. The service entrance leads to a detached two-car garage and staff parking area. Above this garage, three rooms ensure ample space for staff offices or as an onsite security center. This legacy property caters to the highest echelon of elegance, quality, and comfort, and embodies the epitome of Montecito living. Rarely does an estate of this caliber become available to the market. This landmark residence is sure to be treasured for generations to come.